I was starting to think they would wait until I moved out, as I'd been watching the construction of new mailboxes at my apartment over the past couple months. But last week we got new keys and now we have big shiny new mailboxes that are not the width of a business envelope. They're wider than a magazine and a few inches tall. And end to wadded-up mail! I'm going to thoroughly enjoy this for the last few weeks until I'm gone from there. A bit of a scare last week when my KVM switch at home quit working. I had to pull out my spare monitor to use for my pc Sidekick and have the fun of switching the mouse and keyboard back and forth manually, while wincing over the prospect of $100+ for another KVM switch that I can't afford right now with moving on the agenda. But I discovered on Saturday that the cord for the KVM switch happens to look just like the cord for my phone and my printer so I'd just unplugged it by accident. Thank God, no replacement needed! On Sunday morning, I checked the forecast for the week and busted out laughing. 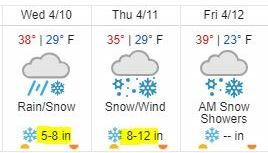 It feels like the state of Minnesota is saying "You guys all got so super excited over that monster mid-April blizzard last year...LET'S DO IT AGAIN!!"